I have to admit I was hooked on this children’s book with the opening lines, even before I realized it was a book about mice and small animals. One of the amazing features of this fantasy children’s book is that it feels so real, it’s hard to remember the main characters are mice…until some size comparison gently sneaks in, and you remember, oh, they are just small mice! This 349-page children’s book includes spectacular use of large vocabulary words and elevated language, perfect for strong readers, and inspiring for others to grapple with. When we read a sentence like this, “Feigning lack of interest… he began whistling jauntily a few bars of his melodious summer song, strolling nonchalantly over the the cloister walls…”, there’s no question that we are in the realm of literature, rather than just an exciting story. There’s so much I can say in praise of this children’s book, such as the fact that the action never stops, the good guys win, and the hero, a mouse, is truly heroic, growing page by page into his own destiny. I personally couldn’t put it down. The imaginary land of Mossflower is vividly depicted, as are the natural habits of the various animals, so that we come to know each animal quite intimately. The book is actually fine for any age, but it will be easier for strong readers to read it independently. 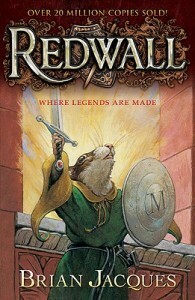 I’m looking forward to reading and reviewing other books in the Redwall series, as there are lots of them. This is a must-have book for kids of any age.